The pallet is precision machined on all surfaces. DEMANDING machining requirements often necessitates workholding that goes beyond standard product offerings. A specially designed pallet vise designed by Kurt Manufacturing Company, represented in Australia by DoAll Australia Pty Ltd , addresses this issue. Standard vises mounted on pallets are an everyday answer to many machining setups. But in some demanding applications, bulk and weight become a problem and these standard pallet vise setups aren't a viable workholding option. To solve spindle clearance limitations, maintain repeatable high precision clamping and make setups faster, Kurt designed a 6” pallet vise that goes beyond standard product offering capabilities. Relying on ductile iron for its workholding, Kurt's designers were very creative in using this rugged material to achieve rigidity and precision with designs that are compact and versatile to allow for fast changeovers. 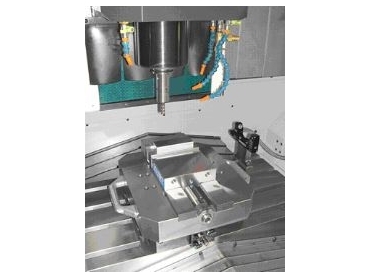 The team started the design process using standard vise components from different model Kurt vises to meet the dimensional and clamping specification requirements for two popular machining centres, the Makino model V33 and the Matsura model FS 550V. "Using standard Kurt vise components, Kurt's design team configured the clamping mechanism consisting of Kurt D688 vise stationary jaw, movable jaw and nut," reported Mr Granlund. "A Kurt D688 shortened screw with internal hex nut was incorporated into the clamping mechanism. “These clamping components included the Anglock@ clamping design originated by Kurt which helps position the parts in the vise jaws. It does this as the clamping force is applied - the part is pushed down and onto the vise base, which also aligns it accurately." The configuration of these clamping components then set the internal template for the pallet into which the components are assembled. All clamping components ‘nest’ precisely within the pallet. The pallet is made of 80,000 PSI ductile iron and has strength and rigidity to hold all parts, large and small, while absorbing and damping machining vibration. The pallet is precision machined on all surfaces and acts both as the receiver for the clamping components and the exterior body adding strength and rigidity to the overall system. To facilitate fast setup on the machine table and removal later, Michael Granlund said the Kurt workholding design team integrated a standard zero point clamping kit into the base of the pallet vise system. "The kit consists of locating posts, springs and air actuated connecting mechanism, which positions and locks the completed system on the machine worktable," he said. "It's a quick connect clampdown device operating on shop air with 0.002mm positioning accuracy. The positive air pressure contained in the connecting mechanism resists contamination of chips and coolant and facilitates fast setups." When investigating the potential for custom pallet vises, users often want more than one, according to Granlund. This was the case for two of these 6” pallet vises for use on the Makino V33 and Matsura FS 550V machines. "The intention is that the workholding is designed and replicated for interchangeable use on different machining centers because it facilitates planning, programming and setting up machining processes," said Mr Granlund. "Different machining centres with different machining envelopes can be accommodated for height limitations and spindle clearance. Both pallet vises have compatible mounting and operation with either machine." The height saving of this Kurt custom pallet vise design provides over 2” of additional spindle clearance for machining deep pockets and other recessed features difficult to reach with standard pallet vise setups. This new custom pallet height measures 2.665” and the overall vise in the pallet measures just 4.735” (this is slightly more than a standard D675 vise’s overall height). Maximum jaw opening using standard hardened steel jaws is 6” with 14.20” overall depth and 6.00” vise width. Outside dimensions for the integrated system is 12.598” x 14.00”. Another feature of the product is the addition of handles bolted to each side of the pallet. Mounted permanently, the handles allow for easier movement of these custom pallet vises on and off the machine tables to any conventional lift rolled to and from the machining centre, as part runs require. No overhead hoists, therefore, are needed to position either workholding setup. Actuated manually, these Kurt pallet vises produce clamping force of 7,450lbs at 55ft lbs. Using .5mm cutters at between 20,000rpm and 25,000rpm for precision milling operations, the company reported that users achieved repeatable ±.0005 accuracy on typical part runs with very nice appearing finishes and no scrap parts. Machined part features using these custom pallet vises range from simple to complex with continuous in-the-cut machine time of over 20 hours. In addition to the repeatable precision these vises ensure, users reported reducing setup time by as much as a half hour.